PAULA RADCLIFFE – Simply the Best! Tomorrow morning Paula Radcliffe, aged 41, will run her final competitive marathon at the scene of her greatest triumph as a long distance runner. The Virgin Money London Marathon will be host to Radcliffe’s final act. It is the stage where in 2003 Radcliffe set the women’s record time at 2 hours, 15 minutes and 25 seconds. This is seen as one of the most imposing records in world athletics. Unfortunately Radcliffe has been forced to bow out of elite competition due to a recurring injury in her left foot however the legacy she has made leaves much to commemorate. 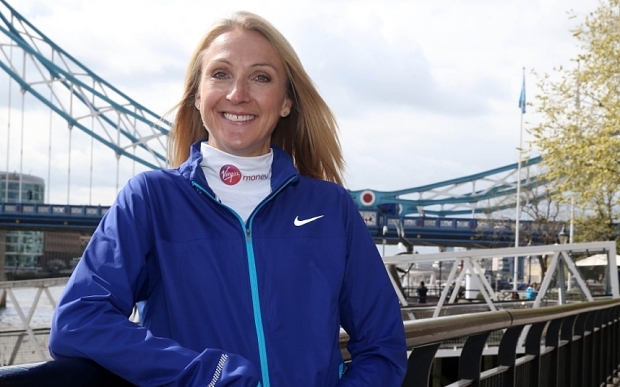 Paula Radcliffe has been a stand out figure in the fight against doping in elite sport. A year before her quite remarkable record beating run, the British athlete asked the International Association of Athletics Federations to increase the frequency of her doping tests. Radcliffe’s physiotherapist, Gerard Hartmann, even insisted that Radcliffe would meticulously check her water bottles pre race to check that the bottles had not been contaminated without her knowing. Paula Radcliffe has been an outstanding British athlete; there is no one quite like her. Radcliffe has won the London marathon 3 times in 2002, 2003 and 2005. She has done the same in New York in 2004, 2007 and 2008 also winning the Chicago marathon in 2002. This great athlete has represented her nation in several international competitions including the European championships, World championships, the Commonwealth Games and the Olympic Games. Radcliffe’s athletic success was testament to her tremendous fitness levels and unique tolerance for pain. Radcliffe was known to run, on average, a staggering 140 to 150 miles a week; running for hours on end in the morning and again in the afternoon. Radcliffe would peak at the 2003 London Marathon, that day would be her golden moment in time. Had things gone differently at the summer Olympic Games in Athens the following year Radcliffe believes herself that she would have broke her record. A freak accident would prevent Radcliffe competing to her full potential at the event in 2004. While out for a jog, a stone hit by a passing car fired into the knee of the athlete which caused a ‘clot and abscess’, and for two weeks Radcliffe was out of action. Pumped with anti-inflammatorys her body was unable to metabolise food, leading to dehydration and white coloured bowel movements. Despite this, Radcliffe ran on but had to stop 22 miles into the race. The British press branded Radcliffe a failure and a choker, unaware of her injury. Still most of this flack has continued to this day. Tomorrow morning on her return to the London Marathon, Radcliffe aims not to break her record but to run the race in under 3 hours, and to do so would be a huge send off and thank you to the fans and to the sport that she loves.